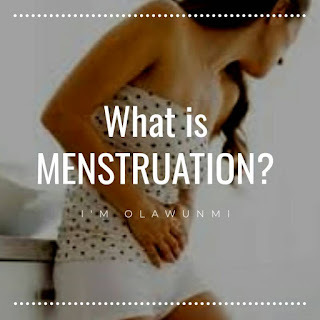 Frequently Asked Questions (FAQs) about Menstruation. This pain that is felt during menstruation is also known as *cramps* and it mostly occurs at the lower part of the belly, the pain sometimes radiates to the back and part of the thighs. This pain can occur before or during menstruation and the intensity differs in people. 👉 As I have explained in my previous post, approximately once every 28 days, if there is no sperm to fertilize the egg, the uterus contracts to expel its lining. Hormone-like substances called prostaglandins trigger this process. Prostaglandins are chemicals that form in the lining of the uterus during menstruation. They cause muscle contractions and cramps that are similar to labor pains. They can also contribute to other symptoms felt such as nausea, headache, irritability, diarrhea, some people even have fainting spells and their activities are grossly distorted. -Endometriosis (a condition in which the tissue that lines the uterus grows outside it). - Pelvic Inflammatory Diseases (this is an infection of the reproductive tract). - Fibroid (these are masses that grow within or outside the uterus). - Others Cysts that could be present in the reproductive tract. For secondary dysmenorrhea, the remedy is to get rid of the underlying cause. Although all dysmenorrheas can be reduced temporarily by taking pain killers. ~ A good diet also helps too (increase your fruit and vegetable intake). - Eat a nutritious diet to maintain the body all together. Well... To an extent excess intake of sugar may have an effect on menstrual although I must tell you that they are not the cause, I've explained what causes the cramps above. During menstruation the body sugar level is quite raised because these prostaglandins are sugar based and taking in processed sugar is like increasing the effect that they produce which is cramps. - Fatty foods/meats (these are usually high in saturated fats, which contains arachidonic acid that produces prostaglandins which can cause uterine contractions, cramping and bloating). - Processed foods/junks (they also contain bad fats that contribute to cramps). I will still address more questions in subsequent posts. I hope you have learnt something different today. Feel free to make your comments and share the post, I really do appreciate them. You can check out other interesting posts at wellnessloaded.com. Take charge of your health and consciously stay healthy. WellnessLoaded is a blog about Health, Wellness and Safety founded by Registered Nurse. Our mission is to make you stay healthy always! 2-year- old cigarette addict. Read story.. Parent will learn from this. Subscribe to Welness Loaded and receive posts updates directly to your mail.